Drawing sharks is easier than drawing humans or sharklike humans. No 1, so I guess that means that running into a wall is only a stun and not an actual hit on the final boss. Oh wow Skärva got big with that form. Ahhhhh Blank is going to use the princess as a shield! Looks like this boss fight is going to end in a spin-off game. Skärva’s Inside Story. I thought it was DRAGONS that usually ate princesses. The giant stone slab looks painful to bite down on. I guess he’ll have to swallow it whole, but then there’s a bunch of chains in the ceiling. Maybe that’s gonna get him swimming in a circle? Or they’re detachable… Which would mean Skärva wins? Still quite concerned about that ceiling, spotlight and drop-down Slab-Bed. Blank! Quick, put on the Iron Boots that don’t drag you down when they’re in your bag! Can you imagine if it was a hit? Blank wouldn’t have to do very much. Having Skarvs actually devour Blank might bring us an… interesting new fanbase. That is a thing which makes it amazing. Luigi is a god. That’s what she said! Wait. At least he has a squishy nose-tip! We’ve been over this. I know, but it mustn’t feel to pleasant. Go big or go home. The ol’ “dodge so they get stunned running into the wall” trick is boss fighting 101! Blank must be off his game if he’s not using that time to wail on Skärva. I think maybe he’s distracted by the princess’ peril? Although now that I think about it, water fighting skills are usually a sore spot for most heroes. I really like the color choices for the underwater panel. 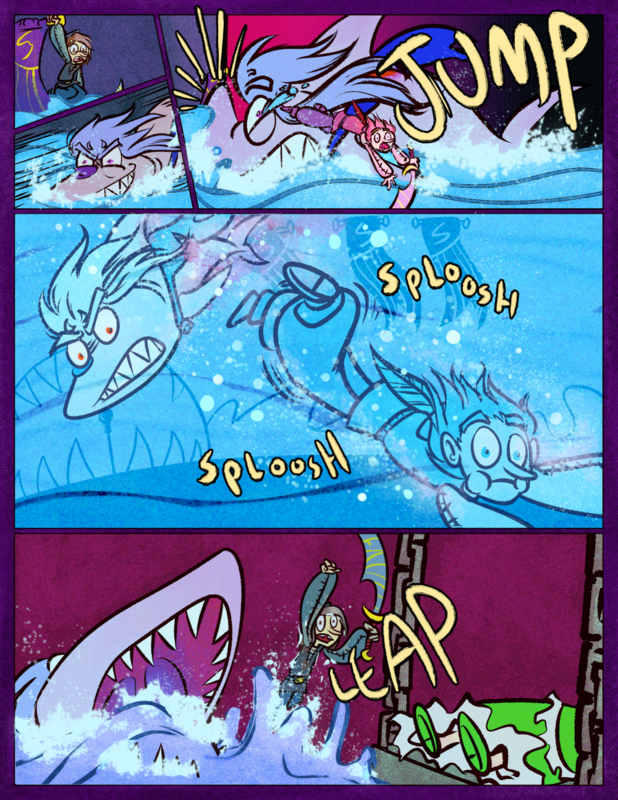 Gosh underwater boss fights were always the scariest for me. I also hope I’ll have learned even more in the next several months and will probably go back and tweak a bunch of stuff before we try to get this published! So many improvements! Improvements are just so fun to seeeee! Oh! Also noticed Blank’s clothes are darker cause they are wet. Very nice touch! Thanks! I just realized in the second panel he should be wet on his bottom half still. I’ll fix that. Blank really jumped the shark in this fight. My jaw dropped it was so waterful. Blank best keep his head above water else Skärva will be biting.